The store itself is sparse, and has a wall of bright and bubbly Japanese kitchen stuff reminiscent of my favourite desk accessory, the Sunshine Buddy. 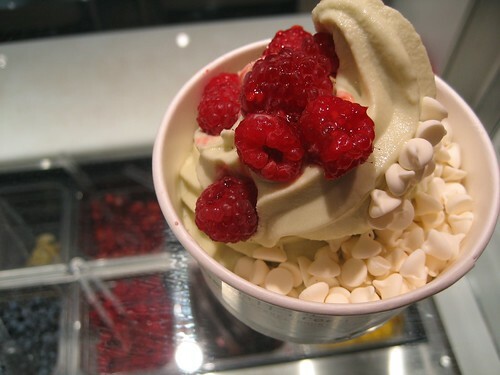 Pinkberry offers two flavours of yogurt: Original and Green Tea. They also have myriad toppings, including Fruity AND Cocoa Pebbles (in addition to the usual fruits and chocolate chips). They also offer carob chips which seems a bit odd to me, probably because my mom used to try to pawn off carob chips on us as being the same as chocolate chips, and, not so much. Bri ordered Original yogurt with Fruity Pebbles and strawberries. I had Green Tea with raspberries and yogurt chips. The servings are generous, and 5 oz will cost you a mere 125 calories. The yogurt is *delicious* - it's slightly tart, and the green tea flavour was subtle and authentic. I'd probably go for a crunchier topping next time -- after all, it's kind of hard NOT to order Fruity Pebbles when that's an option. A small cup with 2 toppings costs around $6, so Pinkberry certainly isn't cheap. It was worth the splurge, as I've never tasted anything like it. In fact, I'm inspired to try sour cream in my ice cream machine this summer to see if I can replicate Pinkberry's perfectly non-sweet taste. The Decemberists' concert was excellent! Lovely music, and a very high-energy performance. Going to Jersey City really wasn't so bad. 2. I LOVE PINK BERRY! I went a million times while in New York, taking every person that ever visited me. Its so delicious and if you get fruit you can convince yourself its like lunch. hooray! The Decemberists are a great band; were named "best of 2006" by the staff at Paste magazine. Although they look similar, the Pinkberry crowd are usually called "Koreans" since they come from a different country than the "Japanese."